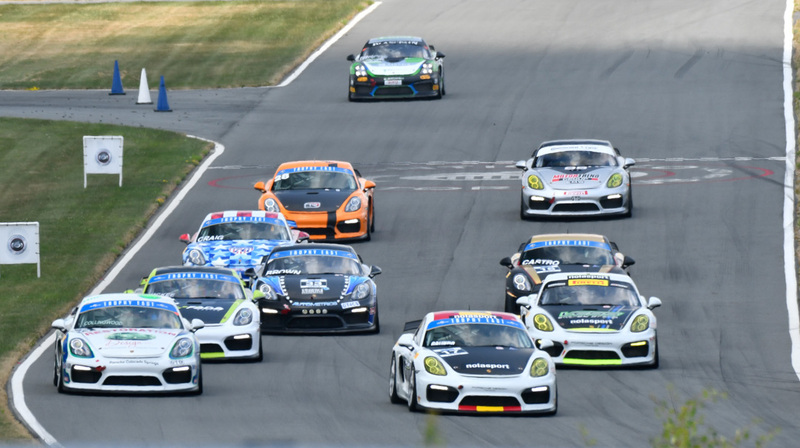 PCA Club Racing Trophy East drivers returned to the beautiful Monticello Motor Club (MMC), a scenic country club in Monticello, New York, over the weekend to compete in three exciting races. During Sprint 1 on Saturday afternoon, pole winner Curt Swearingin, of ACI Motorsports, led from flag-to-flag with the fastest lap time of 2:21.718. Monticello Motor Club member Jack McCarthy finished 13.365 seconds behind Swearingin to snag the second place spot on the TE6 podium, with ACI Motorsports’ Richard Edge coming in third. In the TE4CS class, NOLAsport’s Alejandro Galindo continued his winning streak from the series’ last event at VIRginia International Raceway – coming in first place in class and fifth place overall. Tom Collingwood, of BGB Motorsports, came in second place in his No. 69 Cayman GT4 Clubsport entry and his teammate, Sydney McKee, drove to a third-place finish just one day after she celebrated her 20th birthday at MMC. NOLAsport’s John Crosby led the TE4CS Masters class, placing first with MMC member Charlie Craig nabbing the second place finish in his No. 76 “Old Glory” Cayman GT4 Clubsport entry. Series newcomer Roger Warner came in third with his No. 98 Clubsport entry. Later that afternoon during Sprint 2, the TE6 class repeated their 1-2-3 finish with Swearingin, McCarthy and Edge all getting on the podium once again. Galindo and Collingwood also placed first and second, respectively, in the TE4CS class, and MMC member Efrin Castro drove to a third-place finish in class with a large fan club full of family and friends cheering him on. TOPP Racing’s Russell Walker competed in Sprint 2 in his No. 28 Clubsport entry, and although Walker was battling side-to-side with Autometrics Motorsports’ Craig and BGB Motorsport’s Bruce McKee for most of the 30-minute race, he wasn’t able to nab a podium finish and came in sixth in class. In the TE4CSM class, Crosby and Craig placed first and second in class, respectively, and Autometrics Motorsports’ Stuart Briscoe took the third place podium spot – his first podium of the season. Following a weekend full of delicious food and amazing hospitality by the MMC staff, drivers were ready and eager to compete in the 80-minute endurance race on Sunday morning. Swearingin once again led the race and placed first in class and overall, sweeping the weekend at MMC. Speedsport Tuning’s McCarthy came in second with Chicago Performance & Tuning (CPT)’s Andy Johnson placing third. This enduro marked Johnson’s first podium of the season. NOLAsport’s Galindo wasn’t able to pull off a full sweep at MMC, after Collingwood and his co-driver, John Tecce, claimed first place in the TE4CS class. Galindo placed second and TOPP Racing’s father and son duo, David and Russell Walker, placed third after sharing their No. 28 entry during the 80-minute race. In the TE6M class, TOPP Racing’s Ken Finch placed first, and in the TE4CSM class, Crosby swept the weekend at MMC, coming in first with Craig and Briscoe repeating Sprint 2’s 2-3 finish. Briscoe co-drove his No. 32 Clubsport entry with Autometrics Motorsports coach Cory Freidman. Next up, the series will receive a well-deserved break before competing at scenic Road America in Elkhart Lake, Wisconsin over Labor Day weekend, September 1-3.